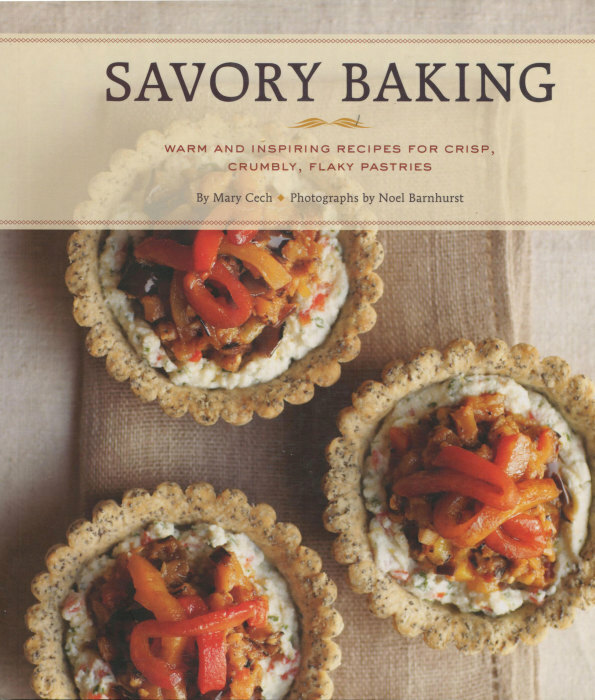 For today’s TBT cookbook review, I want you to consider this lovely book, Savory Baking. Say “baking” to someone and visions of cakes and cookies come to mind. But baked wonders for your main course or ideal sides or appealing appetizers, baked wonders should be a consideration you should not miss. Take a look at this book and get ready for wonderful fall meals. If a picture is worth 1000 words, then the cover of Savory Baking must be valued at least at 1500 words. The cover shows Chili-Grilled Eggplant and Sweet Roasted Pepper Tartlets in Poppy Seed Shells. Underneath those veggies in the picture, by the way, is a charming ricotta filling. These may be tartlets, but a couple of these, some salad, and white wine — well, it would be a meal to remember. The subtitle to this book is Warm and Inspiring Recipes for Crisp, Crumbly and Flaky Pastries. There’s that “pastry” word. Aside from quiche, we too often think of pastry dishes as dinner dessert or breakfast sweets. In terms of complexity, these recipes range from medium to a tad high. There are layers of ingredients and flavors, each layer taking its own time and the architectural buildup requiring perhaps an afternoon in the kitchen. But have you looked out the window? Lord, there’s snow everywhere. It’s bitterly cold. Record setting cold. What better way to spend your time than in a warm kitchen assembling some treat that does demand time, but then repays that demand in beauty and flavor. If you leaf through the recipes, admire the many close-up photos, you are sure to be tempted. And if you succumb, as any foodie should do to those temptations, then I think new “favorites” are sure to enter your personal recipe portfolio. Crust, vegetables, and cheese are a combination that has brought flavor for centuries. In Savory Baking you find sophisticated perfection and, even better, it only requires you, your kitchen, and some pastry patience.